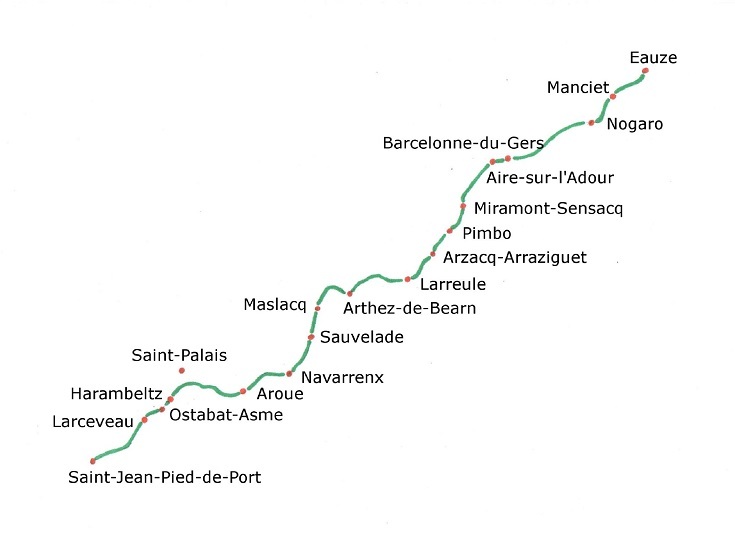 As the GR 65 draws nearer to its final destination, meandering from Eauze to Saint-Jean-Pied-de-Port, it passes through some of the most spectacular scenery to be found along the Chemin de Saint-Jacques du-Puy. The lush green slopes of the Pyrénéan foothills, the crisp white-washed walls and deep red or green window shutters stand in sharp relief to clear blue skies and fluffy white clouds. This is French countryside at its most picturesque—dotted with tiny villages and punctuated by church steeples. 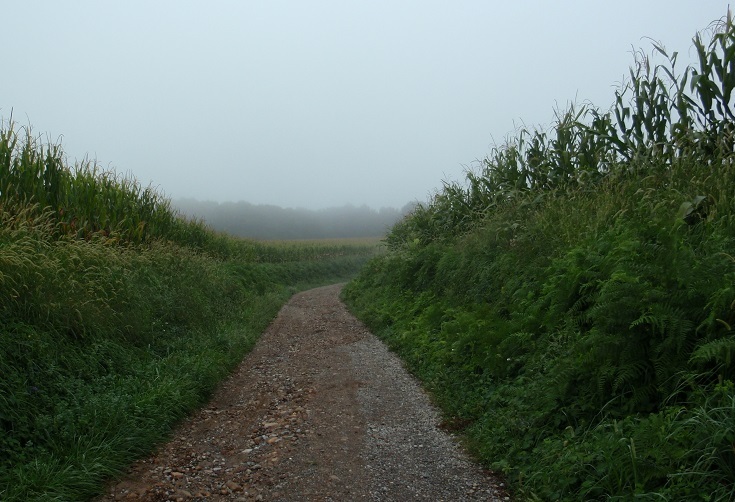 And although the view is of rolling hills and distant mountains, you’ll find this to be an easy walk—mostly flat and never strenuous. Before reaching the splendour of the Pyrénées, the GR 65 winds through endless cornfields—tall green leafy stalks that block the view and threaten to engulf the path or, at other times, broad fields stretching as far as the eye can see. Just when you think it’s all a bit monotonous, a field of sunflowers appears and those dull stalks are replaced with cheerful yellow faces. 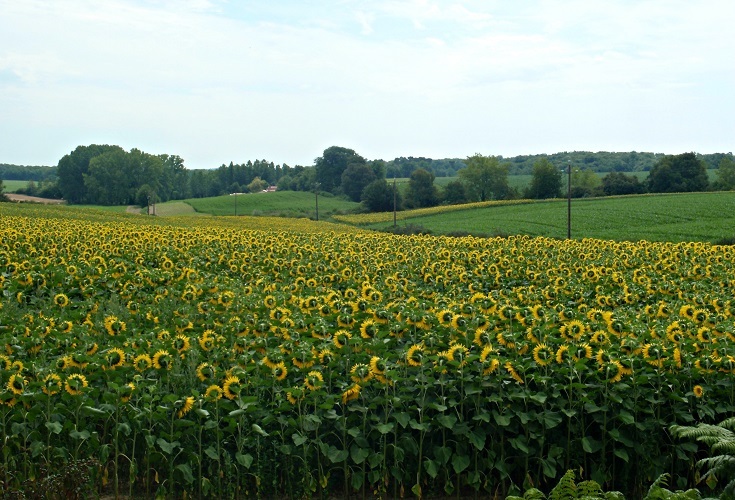 To see the sunflowers at their best, you’ll need to walk during the summer months. France can be uncomfortably hot at this time of year with temperatures reaching 40⁰ Celsius/100⁰ Fahrenheit. Carry as much water as you can manage as there is often little shelter along the path. By early September, the sunflowers are well past their best and a little more imagination is needed to appreciate their beauty. If you’ve walked the entire 730 kilometres (456 miles) from Le-Puy-en-Velay, your arrival in Saint-Jean-Pied-de-Port will, no doubt, bring many mixed feelings. 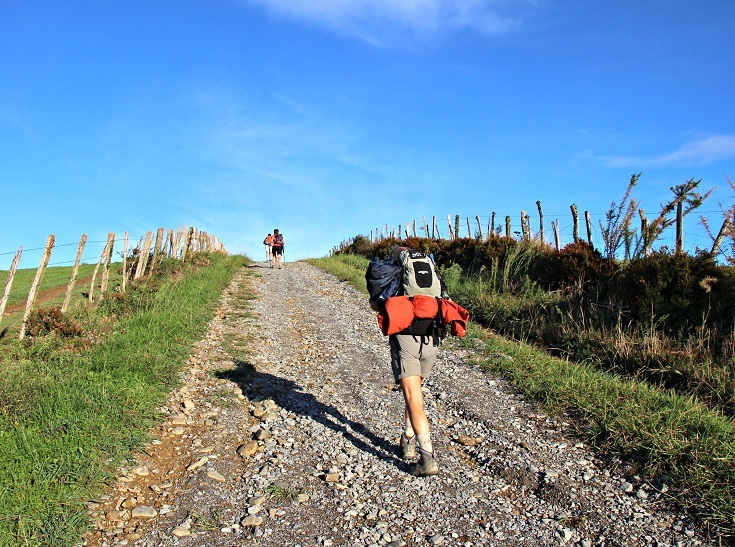 There will be relief and gratitude that you’ve arrived safely, that you can sleep in the next morning (and any blisters will begin to heal!). But there will also be sadness that the friends you’ve made over the past weeks will be going their own way—and that tomorrow you’ll return to the ‘real’ world of bus timetables and everyday activities. 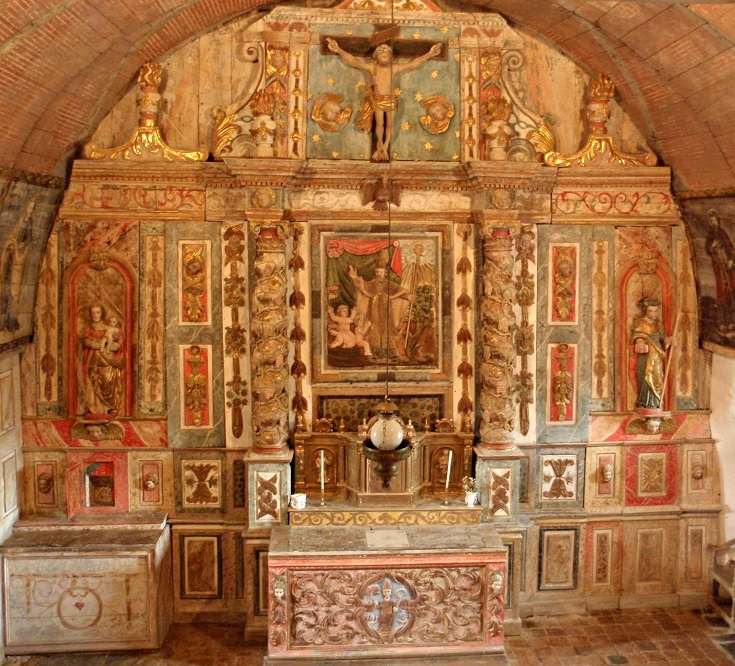 Between Eauze and Navarrenx, you’ll have the opportunity to visit several beautiful churches. 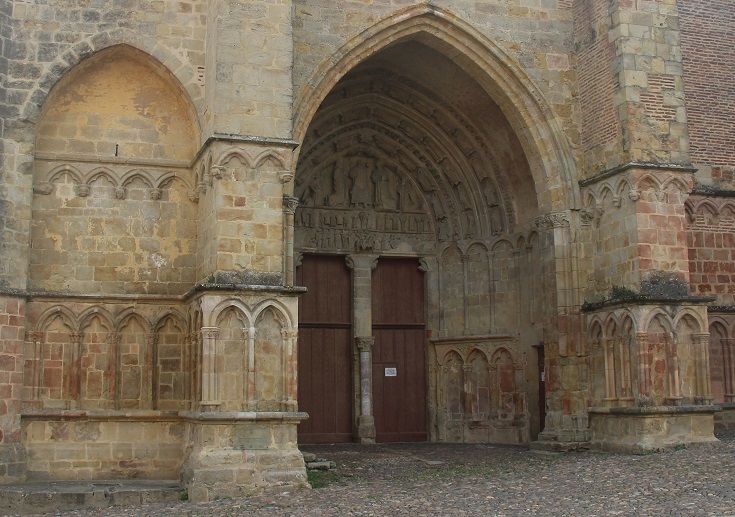 Église Saint-Nicolas in Nogaro was consecrated in 1060 and is one of the oldest fortified churches in southern France. 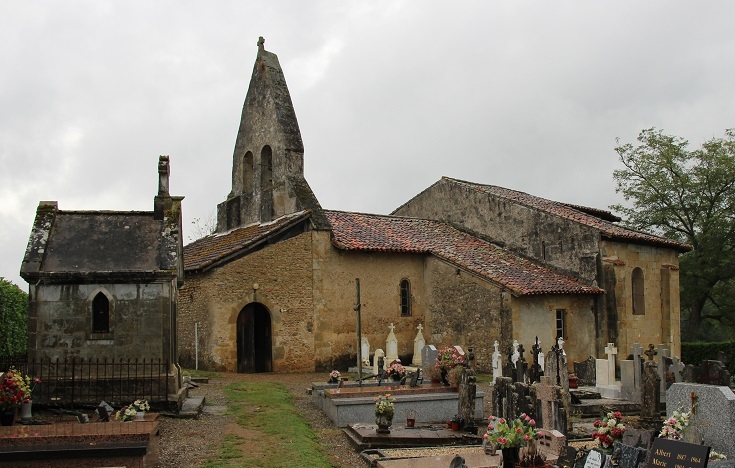 As you climb the hill leaving Aire-sur-l’Adour, stop by the church dedicated to Sainte-Quitterie, a fifth-century princess decapitated by her fiancée when she refused to denounce her faith and marry him. Further along in Larreule and Sauvelade, you’ll find abbey churches where early pilgrims found shelter and a nourishing meal. For me, the highlight of this walk was the church in the tiny community of Harambeltz. Nestled among the farmhouses and cowsheds, its simple stone walls hide a meticulously restored baroque interior. Be sure to visit on a Tuesday or Thursday afternoon when the doors are open to visitors. Église de Sensacq – like many other churches on this walk, its enclosed porch provided welcome shelter from the drizzling rain. 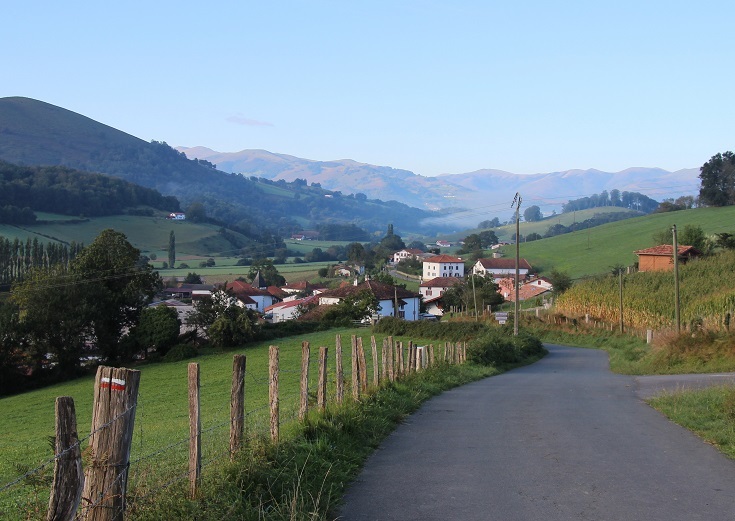 Six days after leaving Eauze, you’ll reach Navarrenx—one of France’s ‘most beautiful villages’ (Les Plus Beaux Villages de France). Surrounded by ramparts and defensive fortifications, the town occupies a commanding position overlooking the river. Take an hour, an afternoon, or perhaps a rest day, to explore the stone walls and beautiful medieval buildings. 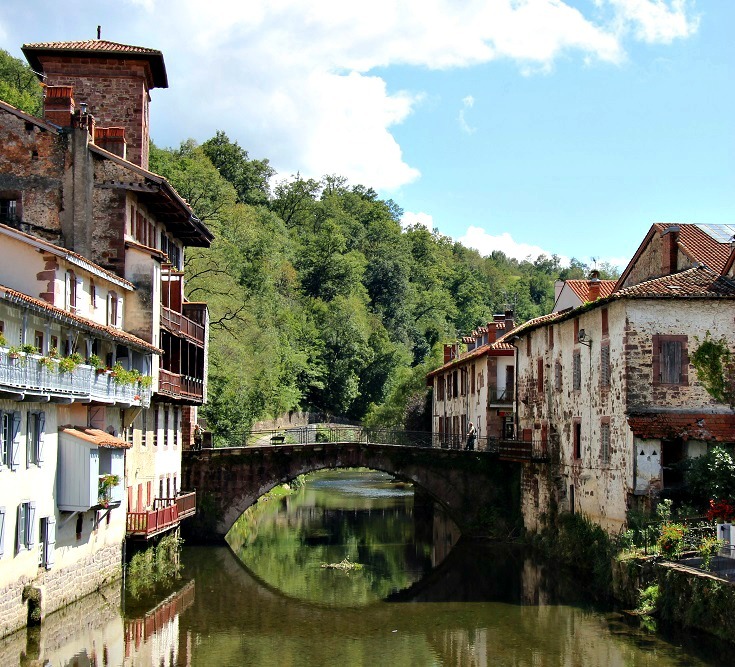 Three days later, your walk ends at another of France’s ‘most beautiful villages’—Saint-Jean-Pied-de-Port. The GR 65 enters the village through Porte Saint-Jacques and continues along Rue de la Citadelle—an impossibly pretty lane lined with chambres d’hôtes, souvenir shops and stores selling anything a pilgrim headed to Santiago could possibly want. 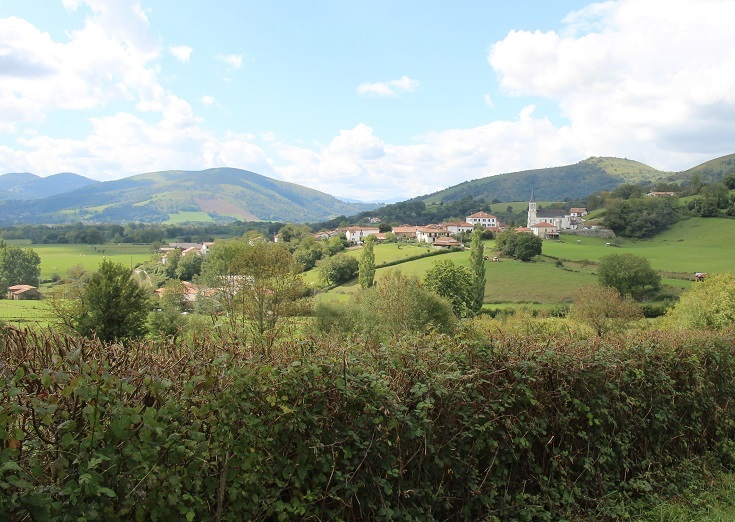 Navarrenx and Saint-Jean-Pied-de-Port are both recent additions to Les Plus Beaux Villages de France, gaining their classifications since 2014. 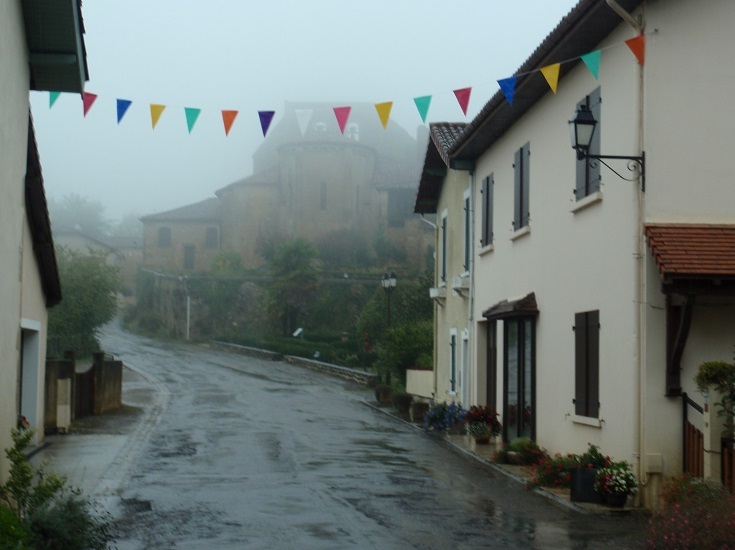 Formed in 1982, with the aim of protecting and promoting the heritage and beauty of small towns throughout France, the association of Les Plus Beaux Villages de France has grown to include 156 villages scattered throughout the country. Ten kilometres from Aire-sur-l’Adour, in Eugénie-les-Bains, you’ll find the three-starred Michelin restaurant, Les Prés d’Eugénie. Michel Guérard has delighted diners here for the past forty years and is considered one of the founding fathers of nouvelle cuisine. Several towns along this section of the Chemin de Saint-Jacques host a weekly fresh food market. You’re sure to encounter at least one during your visit, so make the most of the varied local produce and stock up on fresh figs, nuts and other seasonal offerings to sustain you throughout the day. 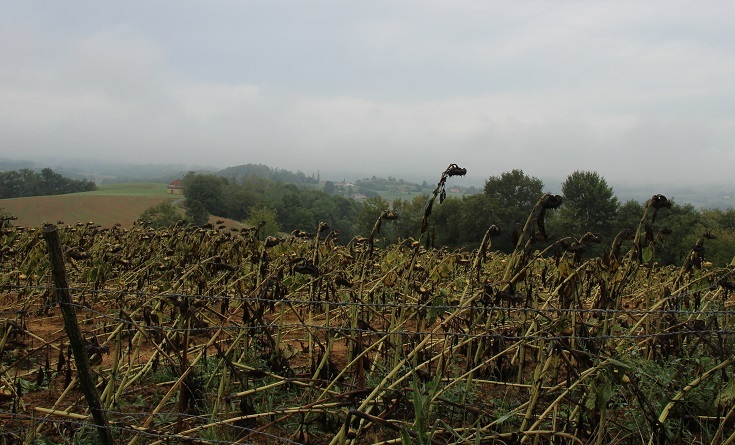 If you have been walking for several weeks—perhaps having started your walk in Le-Puy-en-Velay—you may be looking forward to a day of rest and relaxation. The ‘most beautiful village’ of Navarrenx, with its ancient fortified walls, historic buildings (and good range of cafés) is an ideal place to relax or explore, depending on your energy levels and tired feet. If you leave Navarrenx on a Monday (or Wednesday) morning, you’ll arrive in Harambeltz on the Tuesday (or Thursday) afternoon in time to visit the meticulously restored church. Visiting this church was a highlight for me, and its stunning interior was an unexpected delight among all the surrounding farmhouses and cow sheds. It impressed me so much that it’s become the ‘must-do’ around which I planned the following itinerary. The chambre d’hôte in this tiny community has room for only six travellers so you’ll need to book well in advance to secure a bed for the night. 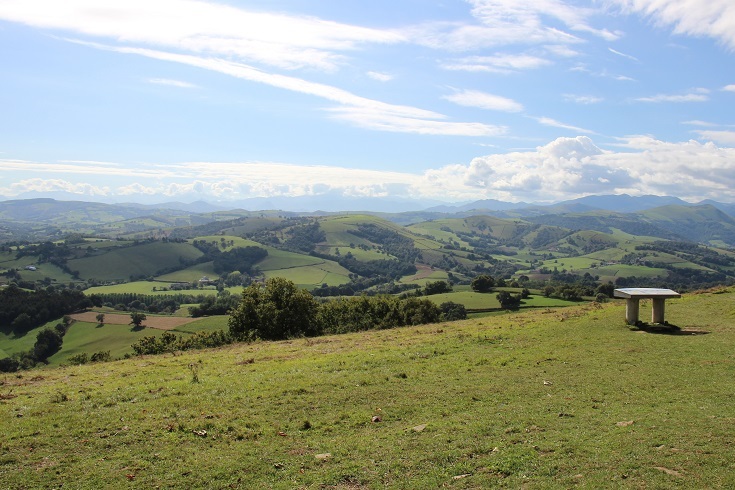 The longest day of walking from Eauze to Saint-Jean-Pied-de-Port—between Nogaro and Aire-sur-l’Adour—covers 27.5 kilometres (17.2 miles), but like the rest of this southern-most section of the GR 65, the way is mostly flat and the walking is easy. If you prefer to break this distance over two days, there are several small hamlets between the two towns that offer accommodation. 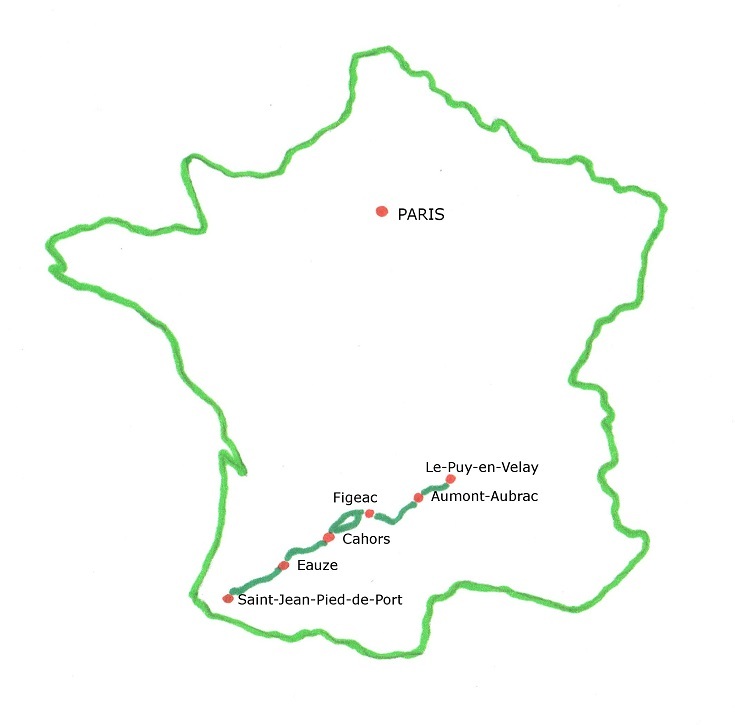 Between Eauze and Saint-Jean-Pied-de-Port, accommodation is available in the following towns, with distances given from the starting point of Eauze. 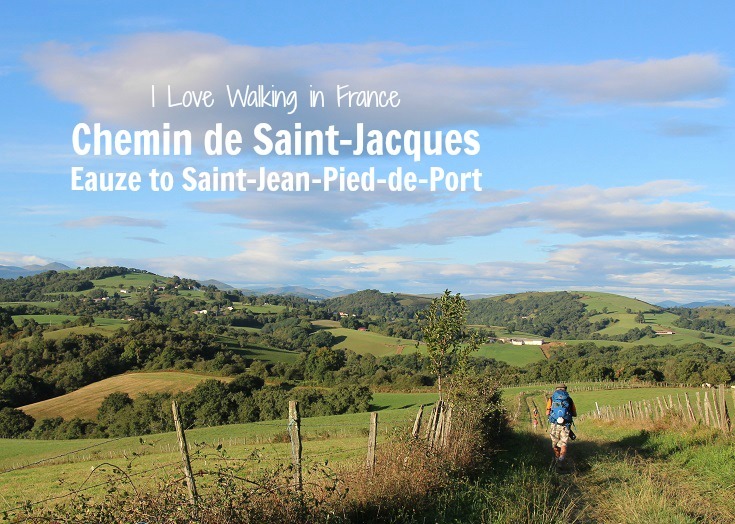 Where is the Chemin de Saint-Jacques in France?